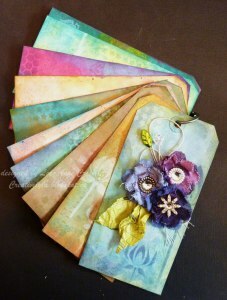 A while ago, the most wonderful Julia Stainton made a gorgeous tag book for her daughter. You can see her post here. Her embellies from Maya Road were absolutely fabulous! My creation is quite different but in many ways the same. The photo above shows the front of my tag book. 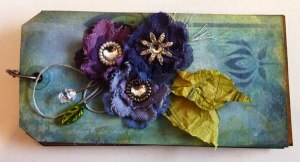 This tag book is for my dear friend Susan who is battling breast cancer. We’ve talked about the power of positive thinking and so this book was my gift to her to write down some positive affirmations and for her to read them daily as well any anytime she feels she needs them. After spending the day with her yesterday, I wanted to share some thoughts on her and her battle. First of all let me tell you that girl has attitude…the type of attitude that needs to be taken when you’re in a fight like this one. Nothing gets her down and believe me nothing will stop her from getting to where she wants to be and that is completely healthy. She takes each and every positive thing…like her test results yesterday and draws strength from it. She smiles, she laughs and she fights. She’s studying ways to change her eating habits to allow her body to fight this terrible disease. She looks at alternative medicine to see what she can draw on to help her in this fight. In other words she is taking matters into her own hands…it’s her life and she will seek any and all things that may strengthen her and make her well. And her attitude is…I’m not dying until I take my last breath. When you are faced with obstacles in life…a winning attitude is what will get you through. Sure it’s easy to crawl into bed and pull the covers over your head or perhaps make like an ostrich…bury your head in the sand and just pretend it’s not happening to you. ATTITUDE makes a difference…whether it’s at work, day to day dealing with loved ones, or sitting in a traffic jam with no where to go. Your attitude makes a difference. A little bump in the road…or a huge mountain to climb…it’s where your head’s at that will make or break you. Every day people encounter challenges, some small and seemingly insignificant, some large and seemingly insurmountable. What determines the outcome is how they deal with it. So to those of you who are struggling with some little or some very large problem. Try, try, try. If that doesn’t work…try some more. Look at different ways to deal with your problems…and use the right attitude to attain success. Dig your heels in and vow to not go down without a fight…like my friend Susan…it’s all in the attitude! Your post was just what I needed to read today! Your friend will love your your beautiful gift! Love the homemade flowers and the maya rd pin! Beautifully done! Have a great day!